“I can’t believe I’m gonna be late,” I mumbled through gritted teeth as I lugged the suitcase down the front steps. The cabbie made no move to help me with my baggage. I silently cursed him and visualized his tip decreasing with each passing second. “What airline?” the cabbie asked when I finally made it to the curb. The cabbie moved to take my bag and I grabbed my purse sitting on top. A flash of something caught my attention. I turned to my right just as my purse was ripped from my hand. I could only watch as a young boy raced down the street with everything I needed to finally be free. “You have got to be kidding me!” I yelled. I looked at the cabbie who only shrugged. For a split second, I almost let it go. I could maybe still make my flight. But I had no money and no license. This didn’t bode well. I had put the move off for a year, praying that he would come back to me. It had taken all my strength to let him go and decide to leave the city I had grown to call home. Before I let myself think twice, I took off down the street after the kid. I would not let this punk ruin my chance at a new life. The streets were practically empty due to the early hour of the morning. The few onlookers we passed just stared in amazement. None of them made a move to stop the little thief. After a few minutes, I could tell the kid was slowing. I watched as he ducked down an alleyway. I hesitated before following him down the dark passage. Who knew what waited for me down there? My eyes adjusted to the dim lighting and I saw the child standing in the middle of the alley. He was smiling. We stared each other down for a few moments. The kid wouldn’t stop smiling. He finally heaved my purse back and threw it at me. I caught it and looked inside to find everything where it should be. When I looked down the alley, the kid was gone. “Well, that was just weird,” I muttered. I looked at my watch and knew that I would miss my flight. I groaned before turning back toward home. As I approached the house, I saw my suitcase sitting on top of the steps. The cabbie was gone. I clenched my fists and looked up at the sky. The sun beat down on my face as I waited for the anger to subside. “It’s just one morning,” I whispered. “It doesn’t mean anything.” I closed my eyes and took a deep breath before turning toward the stairs. I would just find the next flight out and forget about this morning. I stuck my key in the door and opened it to the empty house. All my things were already on their way to my new home. I smiled at the prospect of my new life as I lugged the suitcase back inside. I pulled out my computer and booted it up. I was rubbing my eyes in exhaustion when the knock came. I stared at the door and wondered who it could possibly be. The knock came again and I walked slowly to the door and opened it. He was breathing hard and heavy as if he’d just run a mile. He smiled when he saw me. I stared at him without speaking. I had made it a year. I had let him go. What was he doing here? I felt my body relax for the first time that day as I melted into his arms and thought of the boy who wouldn’t stop smiling. Through the clarity of retrospect, the obvious conclusion surfaced: things don’t always turn out as planned. Annie please give him another chance!! :) Now I want to know what happened next 🙂 Beautifully written! Good story. The start to a happily ever after, perhaps? Perhaps 🙂 But knowing me, probably not… Hah! Just because you never write it doesn’t mean it doesn’t play out anyway. Hmmm… I think I’m too stubborn and would be willing to cut off my nose to spite my face- just to have the satisfaction of telling him to go away. I’m not sure if I could resist the urge to rant about how I wasted a year waiting for him and then he shows up when I’ve made the decision to move on. Then again, the chain of events that caused her to miss her flight could’ve been a sign. But then maybe the sign is that it wasn’t a good traveling day… not necessarily that she shouldn’t go at all. I tried the prompts this week but got nowhere. I could only envision bad things. But I like how that last line ends up happy. I could only think dire thoughts. It’ll end poorly for them. There was a reason it had come to that in the first place. I wasn’t invited to read this? I thought it was kind of an open invitation thing. Man, I really wanted her to be all like “Where the f–k have YOU been for the past 12 months!?”. But, given the same set of circumstances, I’d likely do the same. I mean slap his face… You get it. Dammit. It’s a great story,I loved reading it,so simple yet so beautiful,thank you. I’ve been hearing that a lot! 🙂 Thanks! I have to say that I would fall into the Slap Him & Move On camp, but who knows, life can be funny like that. 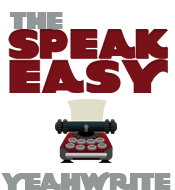 Really well written piece, though – the writers I’m finding here at the Speakeasy are most certainly going to keep everyone upping their game. Thank you and welcome to the Speakeasy! What is more important; people or luggage? Nahhh, she’s going to take him back and make him pay for the shipping, lol. What a nice love story! Great job using the prompt.